New York these days is awash in mostly exquisite works by Jean-Michel Basquiat, thanks to twin exhibitions at Nahmad Contemporary on Madison Avenue (through May 31) and the newly launched Brant Foundation Art Study Center on East 6th Street , the former home/studio of Walter de Maria that’s been masterfully transformed by Richard Gluckman of Gluckman Tang Architects (through May 15). Both exhibitions bear the curatorial hand of Basquiat interpreter Dr. Dieter Buchhart though the smaller Nahmad venue, studded with some 20 works dating from 1979 to 1987, is devoted to the artist’s experimental and assuredly poetic use of collaged, color Xerox photocopies on canvas and other substrates. 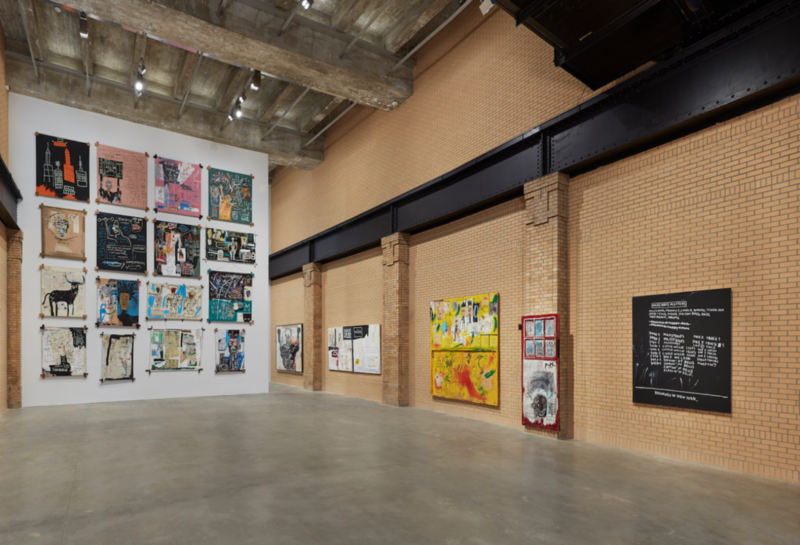 The 7,000 square foot exhibition space at Brant stages a breathtaking, greatest hits approach to the artist’s ultra brief but prodigious practice that ended with Basquiat’s tragic death at age 27 in 1988 from a heroin overdose. Most of the paintings, strategically arranged on four floors of Brant’s East Village art temple, including a cinematic wall hung salon style with 12 works, are sourced in large part from the magnate’s extensive collection which began in the ‘80’s. Brant is also credited as the co-curator of the exhibition. Of that dozen, but not one of Brant’s, “Future Sciences versus the Man” from 1983 was the subject of a recent lawsuit and trial (also in New York) that found an art advisor guilty of taking “secret profit’s” totally one million dollars from a 2011 transaction. 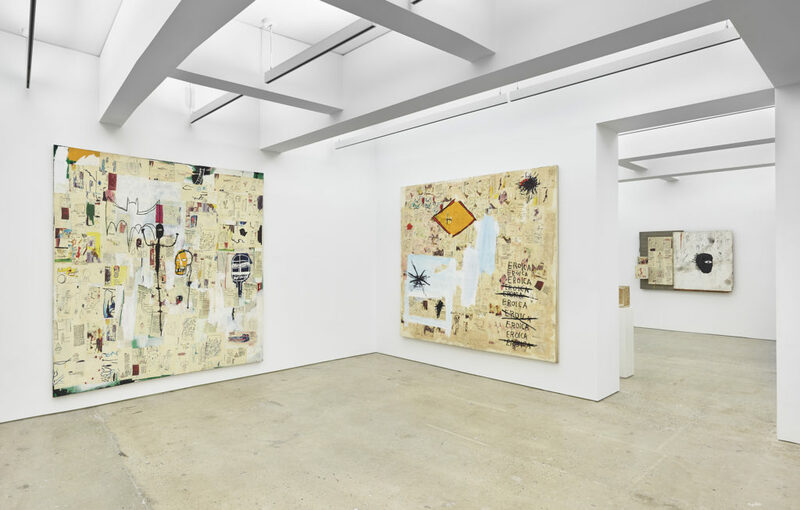 It seems there’s was a story to share behind every painting both uptown and downtown, all of which adds greater gravitas and serial drama to Basquiat’s now bullet-proof legacy. Other named lenders make up an international coterie, including Fondation Louis Vuitton (a co-organizer of the exhibition), The Whitney Museum of American Art, The Broad in Los Angeles, Swiss dealer/patron Bruno Bischofberger, New York hedge fund titan Dan Loeb, French art trader John Sayegh-Belchtowski and the Japanese fashion mogul Yusaku Maezawa. 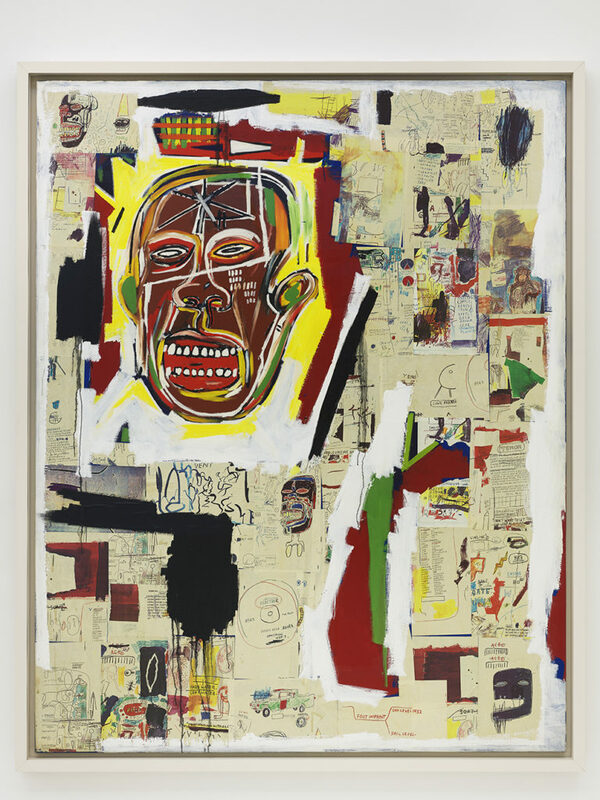 It was Maezawa who bought Basquiat’s “Untitled” from 1981 at Sotheby’s New York in May 2017 for a record $110.5 million, announcing it on his Instagram feed and currently rated as the most expensive piece of art at auction by any American artist, living or dead. It effortlessly surpassed the record Mark Rothko, “Orange, Red, Yellow” from 1961 that fetched $86.8 million at Christie’s New York in May 2012 and Willem de Kooning’s “Woman as Landscape” that sold for $68.9 million at Christie’s New York last November. For comparison sake, both the Broad and Maezawa loans feature Basquiat’s famed skull image, with Broad’s easily the superior and larger example with its hieroglyphic scrawls and richer colors. Still, it is a juicy treat to view both under the same roof. New York turf is the perfect staging ground since Basquiat is a true native, born at Brooklyn Hospital in 1960 and died at his Great Jones Street loft in 1988, just over a year after his mentor and father-like muse Andy Warhol passed away following routine gall bladder surgery at age 58. Not surprisingly, before this latest round robin, New York audiences have enjoyed a surfeit of posthumous Basquiat exhibitions, starting with Vreg Baghoomian’s spectacular SoHo sendoff and hard bound catalogue in 1989 that included masterworks such as “Red Warrior” with its sword wielding figure (now at Brant) and “Red Joy” from 1984 and featuring a sphinx like black figure surrounded by collaged, abbreviated yet encyclopedic like entries on anatomy and zinging word play (at Nahmad Contemporary). Baghoomian, a cousin of art dealer Tony Shafrazi, was Basquiat’s last primary dealer who staged the artist’s final lifetime show in 1988, and later, went bankrupt against a slew of allegations, including selling five fake Basquiats at a Paris art fair in 1994. 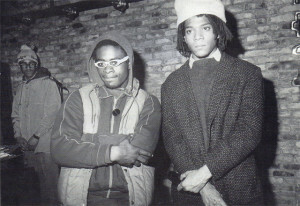 Baghoomian died in 2003 at age 61, his reputation as Basquiat’s last champion ruined beyond repair. Continuing that posthumous New York trail, the Whitney’s 1992-93 retrospective curated by Richard Marshall, “Basquiat,” did much to resuscitate the artist’s cast off image as a burned out drug addict, then a retrospective at the Brooklyn Museum in 2005 furthered that rehab. 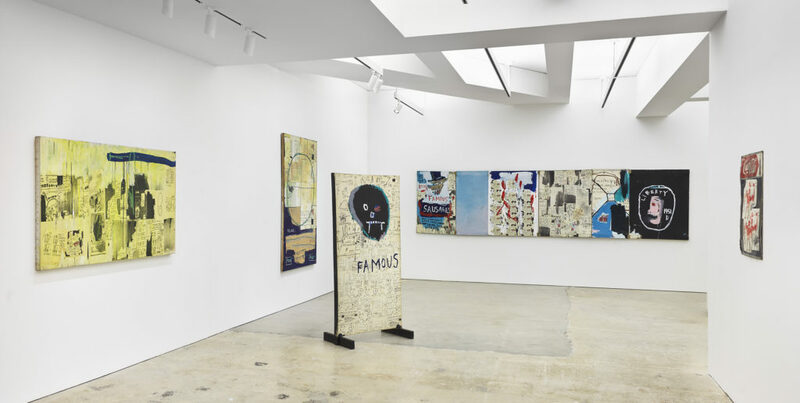 “Jean-Michel Basquiat,” presented at Gagosian Gallery in 2013 and featured over 50 works, including a number featured both at Brant and Nahmad, was world-class. “Basquiat: The Unknown Notebooks” at the Brooklyn Museum in 2015, sourced from the collection of Larry Warsh and “One Basquiat,” also at The Brooklyn Museum in 2018 and featuring Maezawa’s “Untitled” masterpiece, “through the generous support of Yusaku Maezawa,” drew crowds and further polished the artist’s super star aura. Of the two venues, Nahmad Contemporary is the easier one to digest given its sharp focus on the artist’s brilliant exploitation of the Beat Generation influenced Xerox collage technique which he more or less invented starting in 1979. 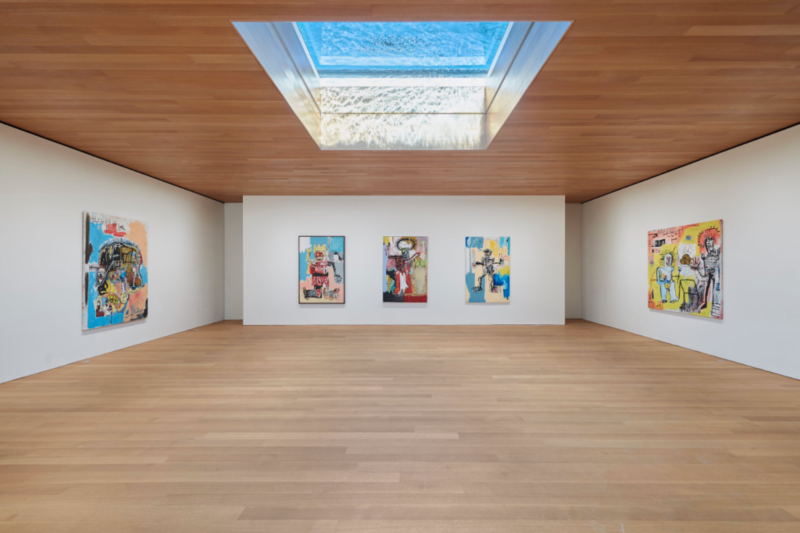 It is the gallery’s second full-blown look at the artist, coming on the heels of Buchhart’s “Words Are All We Have: Paintings by Jean-Michel Basquiat” in 2016. Brant, of course, hits all the home runs. Unfortunately, at least for those who haven’t yet made it to East 6th Street, tickets for the exhibition are sold out though the foundation is still taking online requests for wait list admission. In light of these venues, I’m ‘re-playing’ “The Legacy of Jean-Michel Basquiat,” an article I wrote in October 1992 for Art & Auction magazine. This entry was posted in Blog and tagged Brant Foundation Art Study Center, Bruno Bischofberger, Fondation Louis Vuitton, Jean-Michel Basquiat, John Sayegh-Belchtowski, Larry Warsh, Mark Rothko, Nahmad Contemporary, Richard Gluckman, Richard Marshall, Roberta Smith, The Broad, Tony Shafrazi, Vreg Baghoomia, Whitney Museum, Yusaku Maezawa. Bookmark the permalink.